Carol Deppe, in her delightful book The Tao of Vegetable Gardening introduces us to the concept of Eat-All Greens. Carol grows these by broadcasting seed of one of her carefully chosen greens crops in a small patch. When it reaches 12″ tall, she cuts the top 9″ off for cooking, leaving the tough-stemmed lower part, perhaps for a second cut, or to return to the soil. I wanted to try this idea in Virginia, where the climate is fairly different from the Pacific Northwest where Carol lives. Twin Oaks Eat-All Greens on October 9. I decided fall was a promising time of year to try this scheme, as our spring planted greens only have a short season before they bolt. And summer is too hot, winter too cold. . . We sowed in mid-September, and are about to make our third harvesting foray. 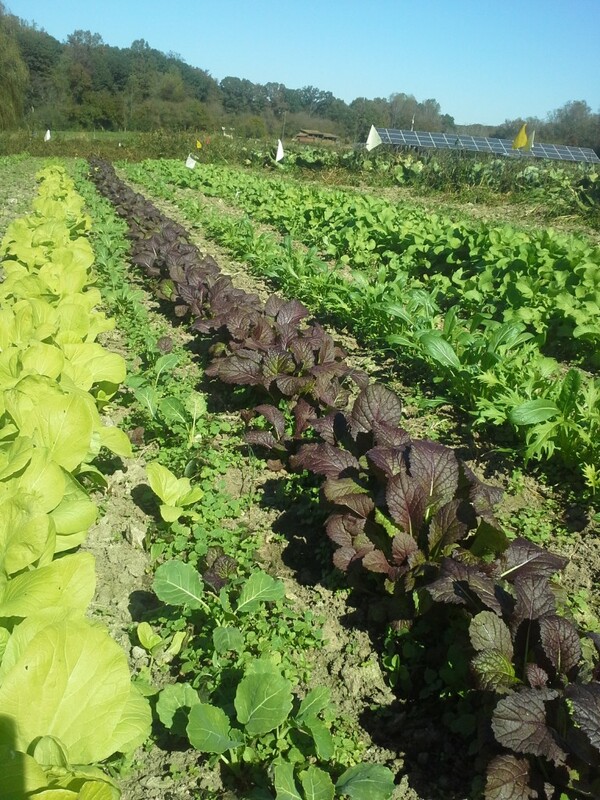 Unlike Carol, we sowed our greens in rows side by side. This fitted better with the space we had, a large rectangle where our asparagus used to be. The organic matter content of the soil is lovely, as we used to mulch the asparagus with hay twice a year. But the weed seed-bank is awful! 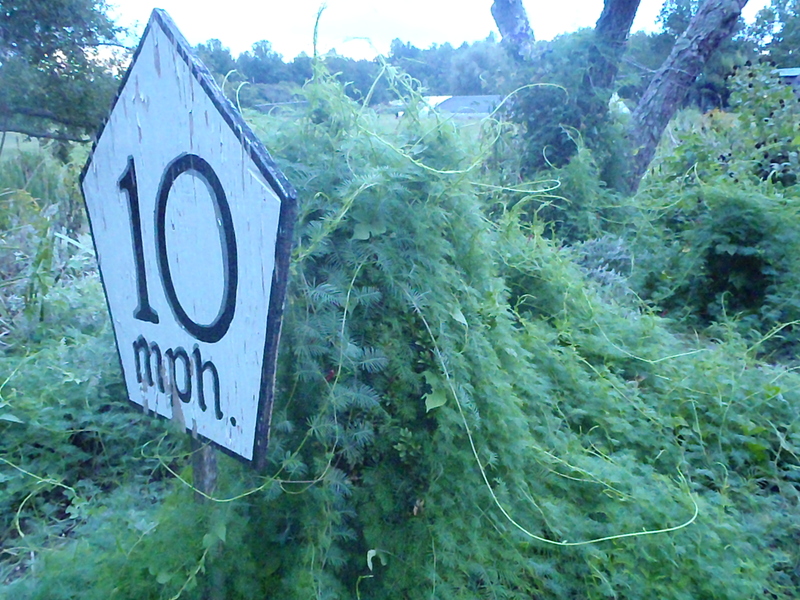 After each asparagus harvest season we let the ferns grow up and the plot became impenetrable. So we got lots of summer weeds, especially morning glories and cocklebur. After about 12 years or so, we decided to give up on that asparagus patch and grow a series of cover crops until we got the weeds under control again. Having the Eat-All Greens in rows, and hoeing between the rows, fit that strategy nicely. Twin Oaks Eat-All Greens on October 19. We sowed on 9/16. I had a lot of help that day. Somehow the seed got sowed very thickly. Carol recommends leaf or pod radishes, some beets, some chards, quinoa, some mustards, some snow peas, some Napus kales, some amaranths, some leafy Asian greens (mustards but less spicy). 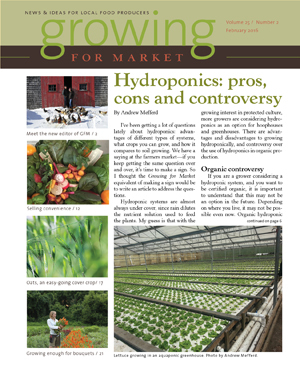 She has put a lot of research into which grow best – see her book for the details. We decided to use some seeds we had on hand and some we got given, that resembled the things Carol recommends. We didn’t want to invest a lot of money first time around, nor wait for a seed company to fill our order. We knew our results wouldn’t be the same as if we lived in the Pacific Northwest anyway. Most of the seeds emerged by 9/21 (5 days), and we hoed between the (wavy) rows on 9/23. We also thinned some of the radishes, because they were sown too thickly. The fava beans didn’t come up till 9/30, but then they grew fast, and became one of the first crops big enough to harvest. Eating the tips of fava bean plants is a practice I learned in England, so I knew these unusual plants are edible. 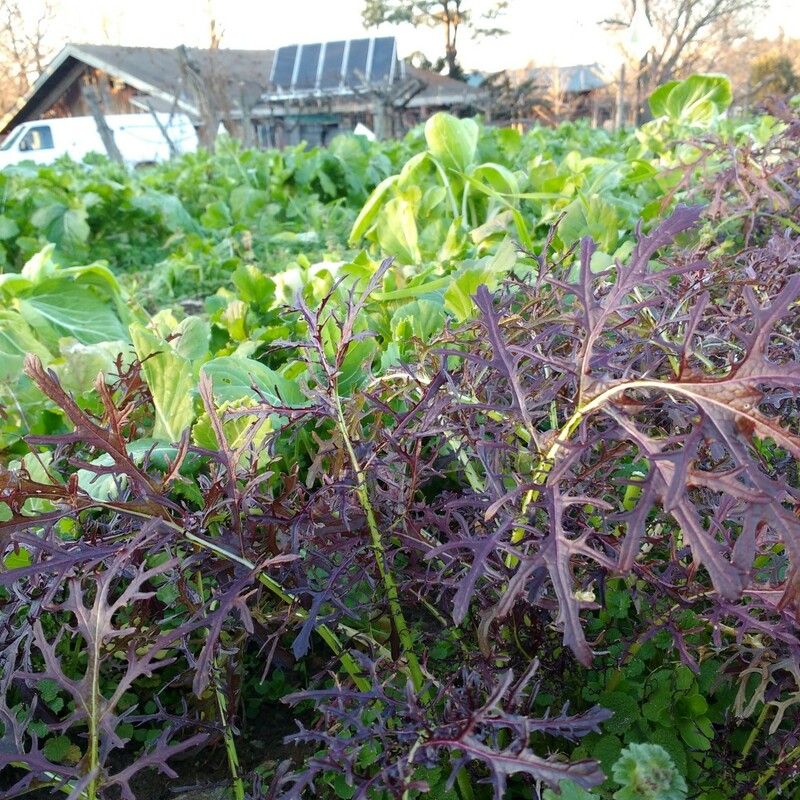 I noticed the beets and chards are all slow-growing in our climate at this time of year, as are the kohlrabi. We had lots of seed of Early Purple Vienna kohlrabi and the seedlings are so pretty I thought they might work for Eat-All Greens, but no, not at this time of year anyway.. 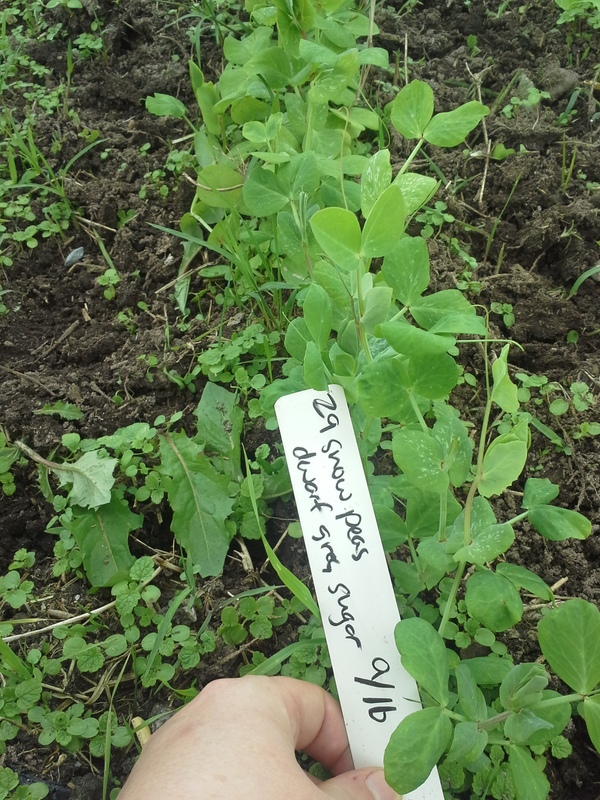 Dwarf Grey snow peas as Eat-All Greens. We got our first harvest on 10/21, 35 days after sowing. The biggest varieties were the fava beans (seed we’d bought, then decided not to grow) and dwarf grey sugar snow peas (seed from last year – we don’t like these as snow peas any more). We cut along the rows with scissors. People found it hard to cut at 3″, high enough to leave the tough stem behind. I noticed we all tended to cut low. 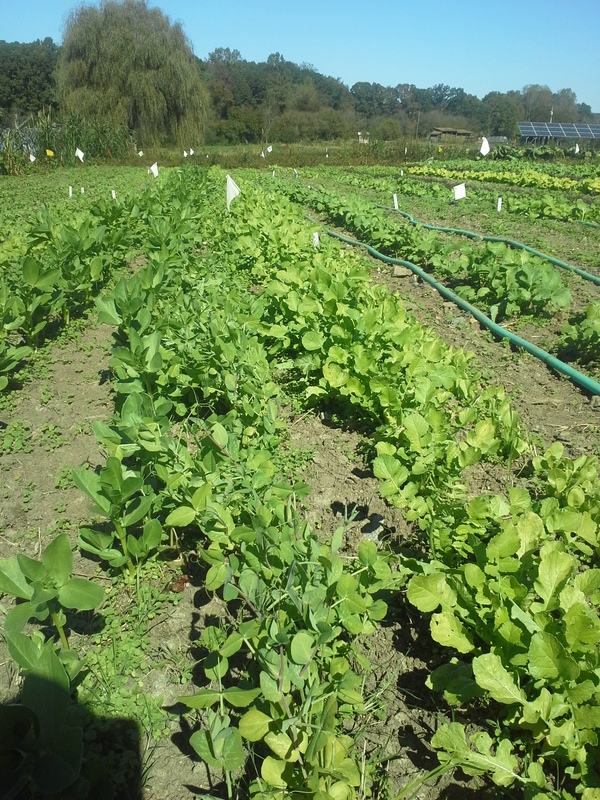 The plan was to lay the cut greens in shallow crates with the stems all aligned to make it easier for the cooks. Some people didn’t do this with the peas, putting them in a big mat in the crate. The peas got served raw, which wasn’t my intention. The stems were too tough for most people – even for cooking, we should have cut higher. We got 3 cratefuls, a generous amount, which we didn’t make the best use of, despite an instructional label. Presentation and instructions are our version of marketing to our cooks. Twin Oaks Eat-All Greens on Oct 22. One week later (10/28) we went for our second harvest. By then the radishes had clearly come into their own, and one of the rows of dwarf grey peas that we harvested the week before had already made enough growth for a second cut. You can see in the photo above the big difference in growth rate between the radishes and everything else. The harvest was bigger than we’d hoped for. We got 10 crates and two very stuffed 5-gal buckets we decided to give to the chickens as a sign of our appreciation. What next? I ‘m looking forward to the Maruba Santoh, and the Ruby Streaks especially. But we have to explain more carefully how these should be cooked, to people unaccustomed to cooking mixed greens. And we need to switch to more frequent forays and smaller harvests at a time. And cut higher up the stems. And then, it depends on the weather. 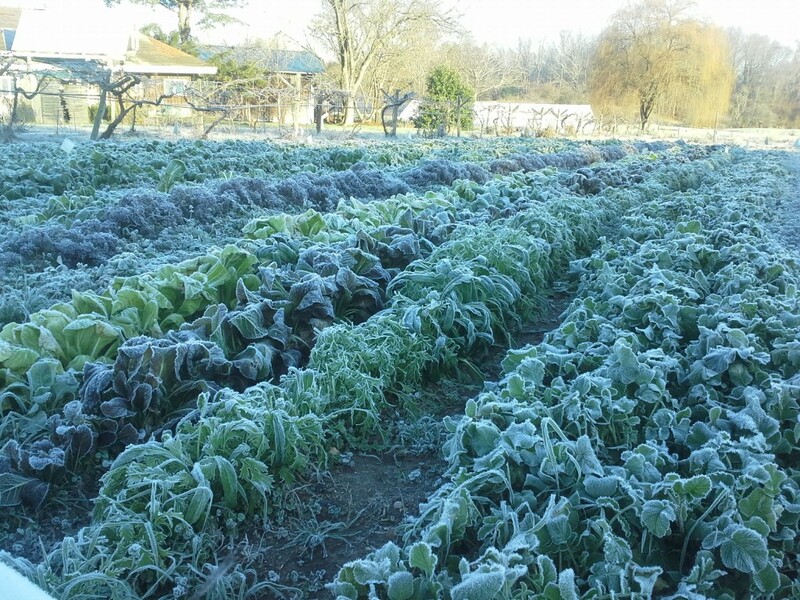 The kohlrabi already got some frost damage. Currently the nights are mostly above freezing. Some of these crops are good down to 25F, some better than that. I’m already thinking what would I do different if we do this again. No chards, no beets, no kohlrabi. Thinner seed sowing, straighter rows (easier hoeing). Try some other Asian greens? 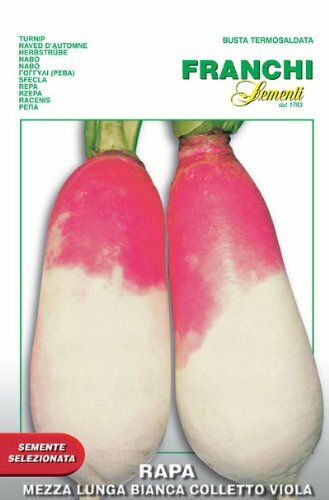 Buy some of the specific varieties that Carol Deppe recommends. Maybe sow a week earlier. And a smaller patch! It’s being fun! Twin Oaks Eat-All Greens – Ruby Streaks. 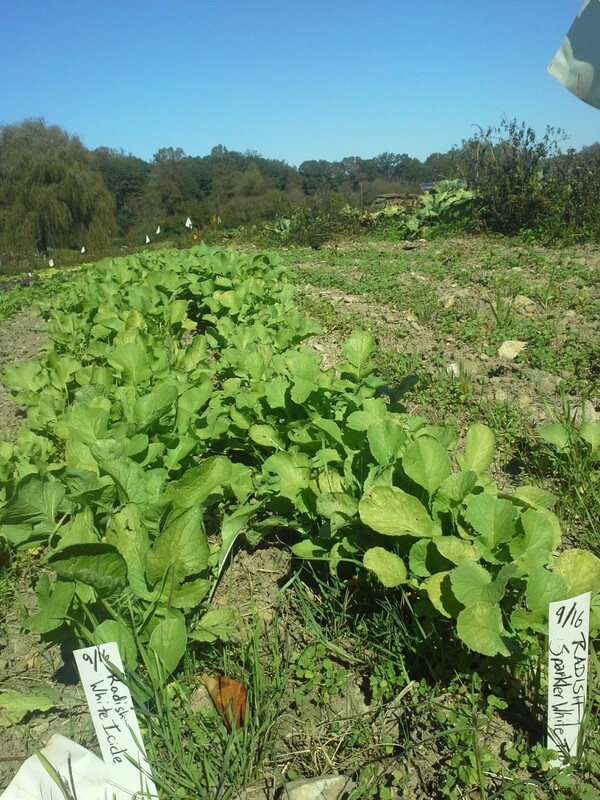 The Virginia Association for Biological Farming has organized this event, and Twin Oaks Community Garden will be tourable at 1pm, 3pm and 5pm on Saturday and Sunday (ONLY!). Tickets (per vehicle) are $25 in advance, $30 on the day, for as many farms as you care to tour. 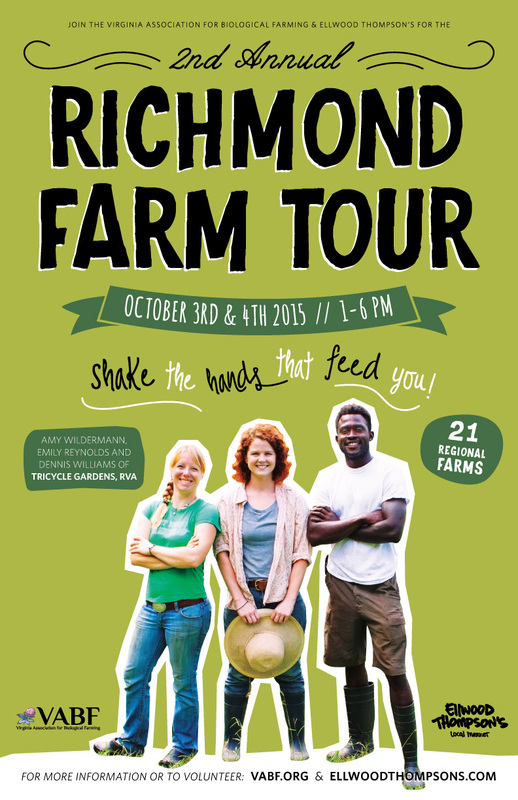 Spend the weekend of October 3 & 4 touring Richmond area organic farms! Buy your ticket now. Load up your car with friends and family (one ticket covers everyone!) and head out for a day — or two — of meeting area biological farmers and seeing where and how your food is grown. Go at your own pace. This farm tour weekend is self-paced with farms located throughout the area. Interested in volunteering? 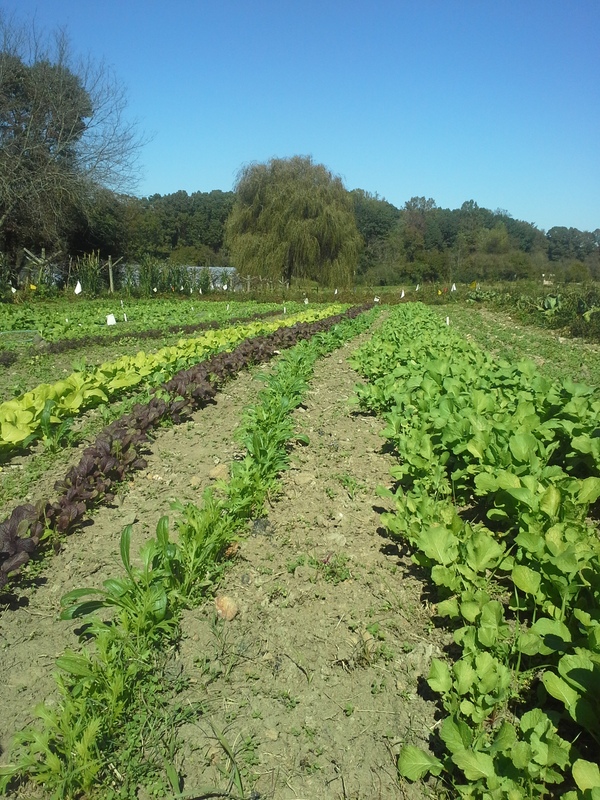 Help us support the local organic food movement in Richmond. Volunteer on one day of the tour and receive a free pass to take the tour on the other day of the tour with a carload of people. Please contact Sue Ellen Johnson at [email protected]. 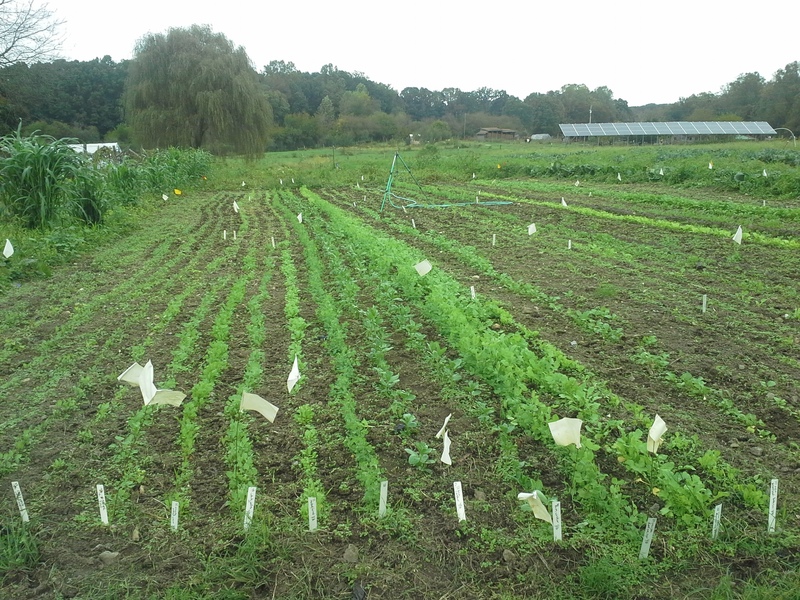 Buckwheat trials are now underway on four Virginia farms. A field tour at Old Crowe Farm in Red Oak happened on August 22. Now it’s the turn of Twin Oaks. The buckwheat trial plots are unlikely to still have buckwheat. Instead you can see the next stage of our experiment – a version of Carol Deppe’s Eat-All Greens. 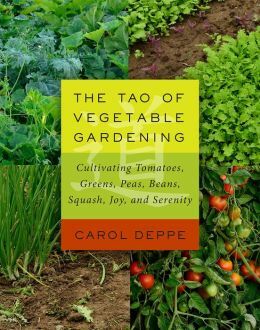 I reviewed her lovely book, The Tao of Vegetable Gardening here. 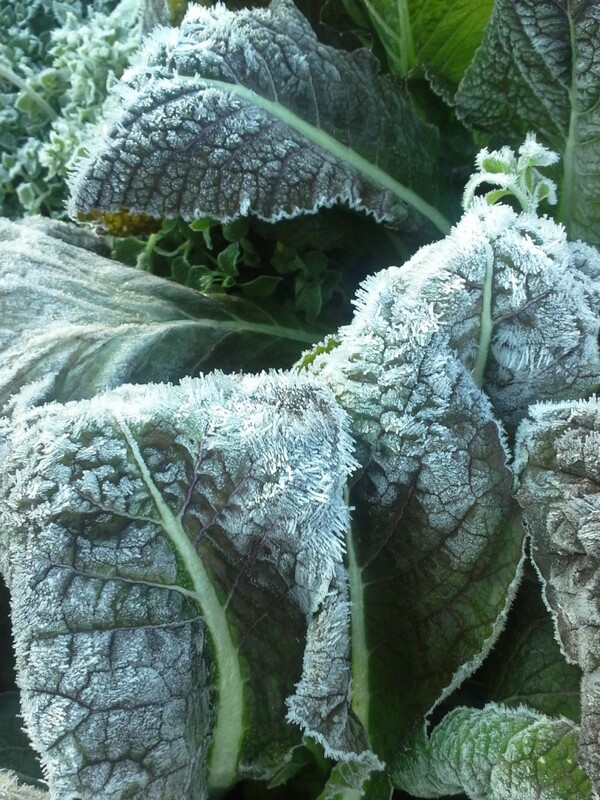 Carol lives in the Pacific Northwest, where she broadcasts small patches of various carefull;y selected crops to cut at an adolescent stage and use for salads or cooking greens. 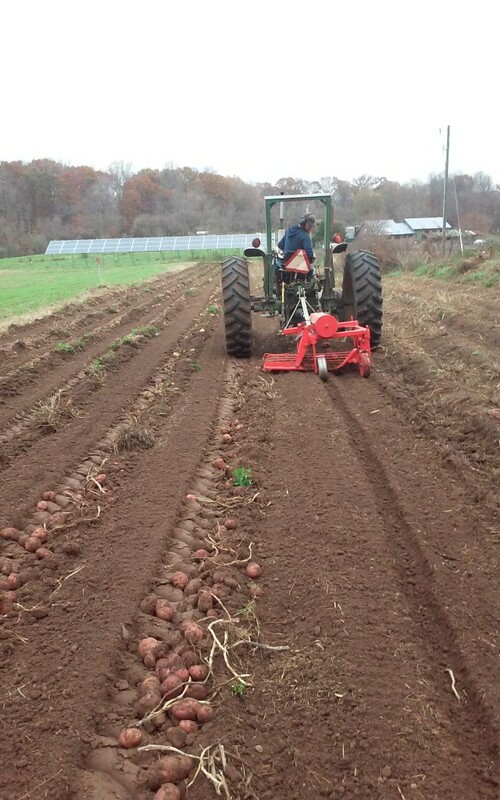 Here in the mid-Atlantic, we are experimenting with fall sowing of rows of various crops that she recommends, and a few others to see what happens. 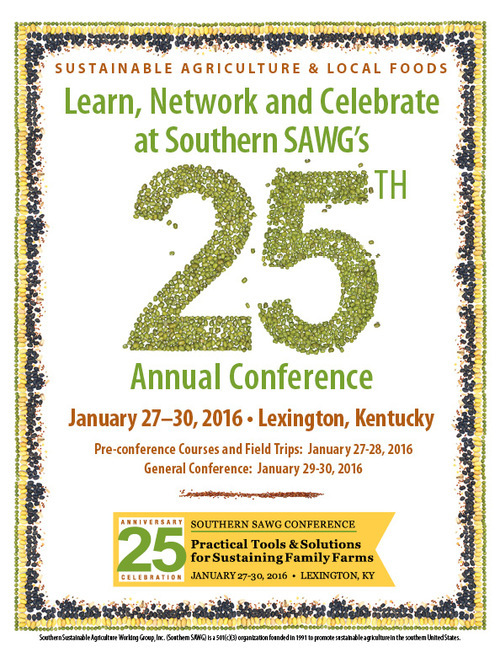 We can also talk about about cover crops, year-round vegetable production and fall season crops. Is animal farming the chief cause of climate change? Not according to what I’ve read. A UN report (FAO Livestock’s Long Shadow, 2006) says that cattle-rearing generates 18% of greenhouse gas emissions measured as the CO2 equivalent. 37% of all human-induced methane (which is 23 x as warming as CO2) is largely produced by the digestive systems of ruminants. So, clearly livestock farming makes a big contribution to climate change. But the high level of pollution from cattle is because of intensive agriculture. Specifically, feeding grain to cattle rather than grazing them. In order to produce lots of meat cheaply, industrial farmers feed grain, which is not a natural part of the ruminants’ diet.The UN says we need to improve animal diets in order to reduce enteric fermentation and methane emissions. Cost-cutting by industrial farming has simply passed even larger costs to all of humanity. We need to eat. Some people like to eat meat. There are parts of the world where farming with grazing animals makes best use of the land. For example, slopes and highly erodeable soils are best kept under sod, rather than plowed up for crop farming. 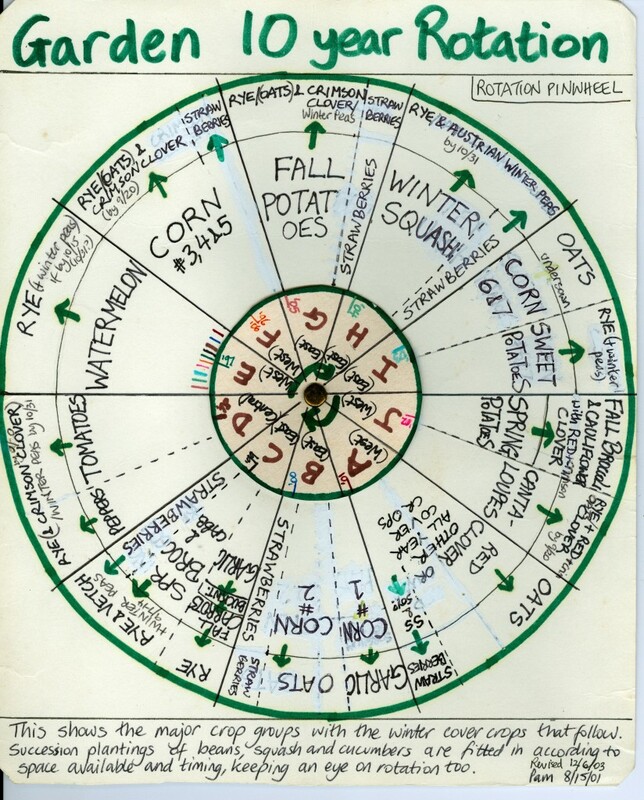 On many farms some combination of vegetable, grain, tree crop and meat farming makes sense, and indeed the diversity can be a strategy for dealing with a changeable and unpredictable climate, as Laura Lengnick points out in Resilient Agriculture. Ducks, chickens and pigs can eat food scraps and vegetable crop residues, and contribute manure. And I’ll leave you with this fun, surprising, interactive website from the LA Times on the Food-Water-Footprint, where you can see how much water is used to produce the plate of food you choose. Inevitably the choices are limited, and the foods are all “Commercial US Average” (let’s hope we’re doing better! ), but the information from the relative values is useful. 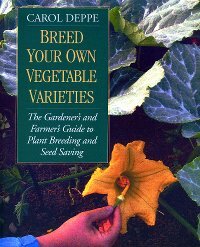 I enjoyed Carol Deppe’s other gardening books, Breed Your Own Vegetable Varieties and The Resilient Gardener. I haven’t read her renditions of Taoist Stories or the Tao Te Ching, but this new book offers entwined wisdom from both aspects of Carol’s life. Something for beginners and experienced growers alike. A combination of Carol’s exquisite attention to detail, solid grounded-in-experience advice and application of Taoist philosophy can help make us better and happier gardeners. Better understanding, more inner harmony. Carol is an independent and iconoclastic gardener, and she introduces each chapter with a passage from her own translation of the 2500 year old Tao Te Ching and intersperses fables from her anthology Taoist Stories. 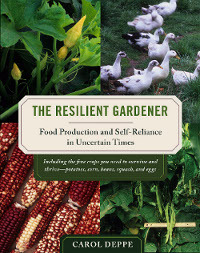 The Resilient Gardener focused on growing basic food staples – corn, potatoes, dry beans, winter squash and eggs. This new book moves us onward to groups of nutritionally- and economically-valuable vegetables we love to eat (and therefore to grow): tomatoes, summer squash, peas, green beans, greens. Each crop is used as an opportunity to explain a technique or concept. 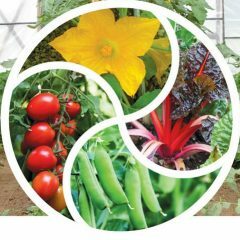 13 chapters with titles like “Honoring Your Own Essential Nature”, “Non-Doing” and “Joy” lead us into the practicalities of crop requirements, plant genetics, lacto-fermentation and preserving land-races. Carol clearly thinks for herself. I enjoy reading her take on the recent “accepted wisdom” of “imitating nature,” by prioritizing perennials, growing in polycultures (the carrots-love-tomatoes school), increasing diversity – “Ant agriculture violates all these principles.” I have long felt irritated and frustrated by the carrots-love-tomatoes belief, so I got special pleasure from reading Carol’s amusing story of actually trying to make interplanting carrots and tomatoes work, despite different needs for temperature, soil texture, soil fertility, watering, plant spacing, mulch, fencing, and length of time occupying a garden bed. And the competition for sunlight. 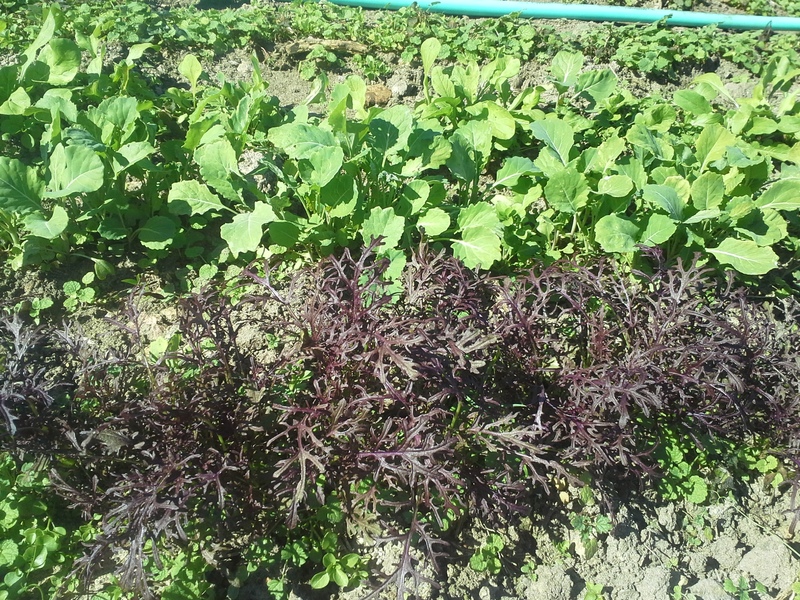 I am a practitioner of some interplanting (spinach and peas, lettuce and peanuts, cabbage and okra), saving space, work, and in some cases, mulch or rowcover. But the almost religious belief that certain crops “like” each other, despite lack of data and lots of practical impediments, drives me potty. Carol takes the time to explain which pairs of crops stand a chance of complementing each other, and to point us towards a study by R Fred Denison (sorry I can’t find the link) that showed that yields of the best intercrop combos were somewhat better than the lower-yielding of the pair as solo occupant of the space, but less than the higher-yielding of the pair was capable of. So don’t plant crops together hoping for increased yields. 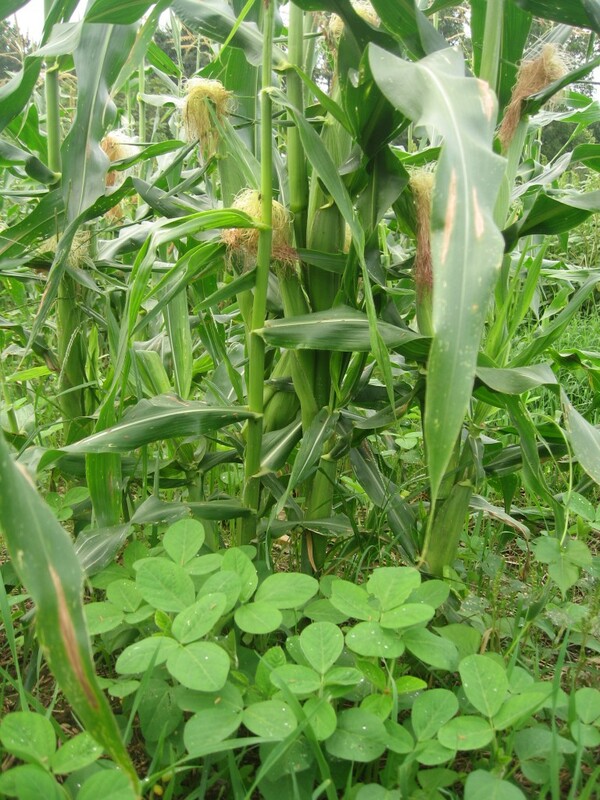 Carol gives examples of intercropping that work for her. She sometimes plants her Eat-All Greens between alternate rows of corn (not sweet corn, which is quickly over), after the corn is up and has been cultivated twice. I’d guess that’s about 4 weeks after planting, the same age corn would be if sowing pole beans to grow up the corn stalks. The greens can grow fast enough in the shade of the corn to need no weeding, and the corn can be harvested from the alternate aisles without trampling the greens. Carol names her “Perfect Polyculture” as Russian Hunger Gap kale (a tall, hardy Brassica napus, unlike the Hungry Gap kale I grew in England, which is an oleracea type), and vining winter squash. 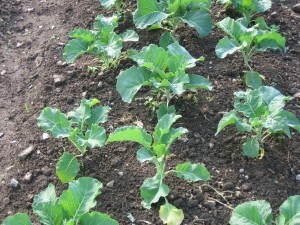 Initially an accident, the self-sown kale came up after she planted her squash. 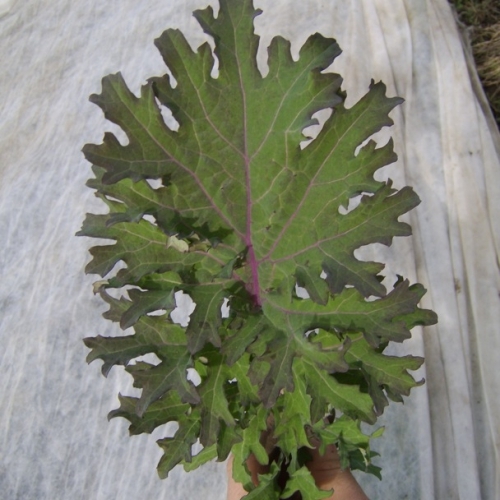 It grew rapidly, and timely harvesting of the kale nearest the squash was important to maintain enough space for the squash to thrive. Carol recommends her Candystick Dessert Delicata C.pepo fall squash; Sweet meat – Oregon Homestead C. maxima and fast-maturing Lofthouse Landrace Moschata C. moschata winter squashes. The Lofthouse squash is not sweet, so works well for soups and other savory dishes. 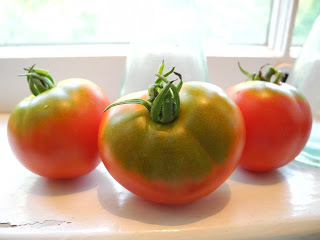 I was fascinated to learn that the green shoulders of some heirloom varieties are a cause of good flavor. The extra chlorophyll develops more sugars and flavors. Modern breeders decided to eliminate the undesired green shoulders and got uniform ripening at the expense of good flavor! My respect for Glacier and Stupice grew! Carol’s favorites for her shady Oregon garden include Amish paste – Kapuler, Pruden’s Purple (flavor, size, earliness), Black Krim, Legend (not for flavor, but for earliness, size, dependability, and especially for late blight resistance), Geranium Kiss (late blight resistance, lots of 1 ounce fruit). Carol explains (Late Blight 101, page 96) why we need to be more careful about Late Blight now. 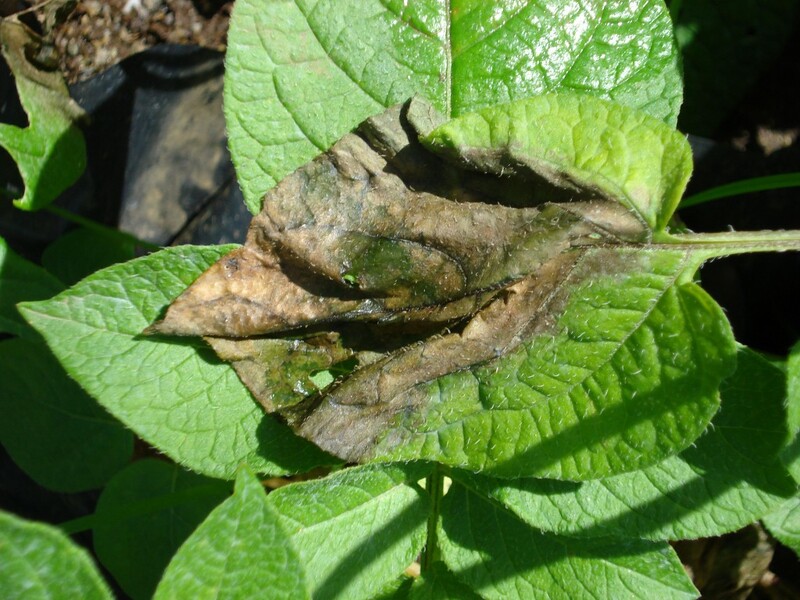 Previously there were several strains of Late Blight, but they were all in the same mating group and could only reproduce asexually (requiring live plant material) – unless we left cull piles of potatoes in our fields, we only got the disease if we were unlucky enough to have spores blow in or be imported on diseased plants. This has now changed and newer strains of Late Blight, from both mating groups, have moved into the US. The disease will be able to evolve more rapidly, and the oogonia (sexually propagated ‘spores’) can persist in the soil. 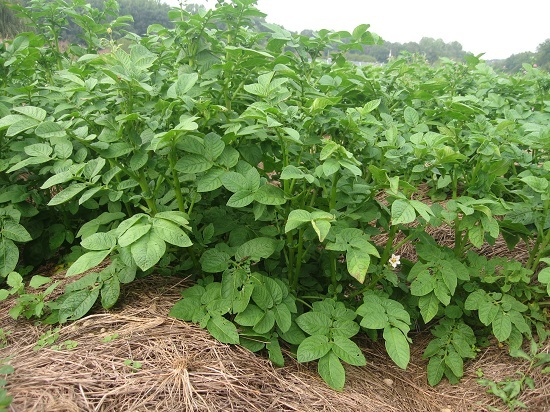 We will need to develop tomatoes and potatoes with stronger resistance. We will need to be more careful and not put any store-bought tomatoes in our compost piles. We will need to get better at recognizing late blight symptoms and acting swiftly. 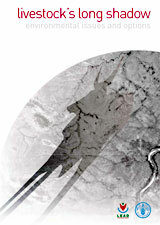 See http://usablight.org/. 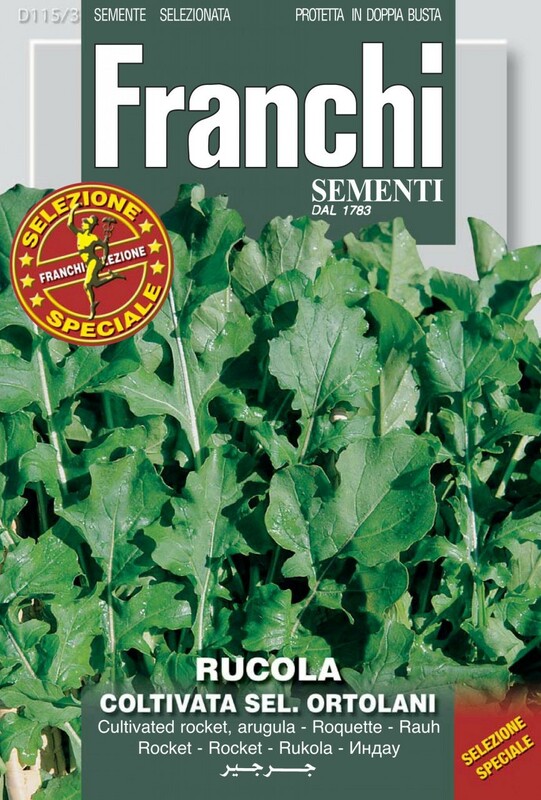 Legend and other of the more resistant open-pollinated and hybrid varieties are very useful in breeding work to produce more varieties resistant to late blight in future. Carol lists the resistance level of 10 promising hybrids (including Mountain Magic which we grow on our farm, Jasper, Golden Sweet, Juliet, Defiant PhR, Plum Regal, Iron Lady, Mountain Merit, Ferline and Fantasio) and 19 OPs (in order of earliness: Red Pearl, Stupice, Slava, Matt’s Wild Cherry, Yellow Currant, Geranium Kiss, Legend, Pruden’s Purple, Quadro, Black Plum, Red Currant, Tigerella, Old Brooks, Black Krim, Brandywine, West Virginia 63, Aunt Ruby’s German Green, Aunt Ginny’s Purple and Big Rainbow. At the end of the book, Carol tells us how to do this. It’s not that difficult. The chapter about the Eat-All Greens garden also has the title “Effortless Effort.” The idea is to broadcast seeds densely enough that no weeding is needed. Harvest when 10-16” tall by cutting the top 7-12” with a serrated knife, leaving the lower 3-4” of tougher stuff. Align the stems in the harvest tote or trug, to make chopping in the kitchen easier. Yields can be as high as 4.5 pounds per square yard (2.45 kg/sq m) in 8 weeks. The patch can be resown as many as three more times in the Willamette Valley climate. This is like a grown-up-tall version of growing baby salads, in that the entire tops of all the plants are harvested together. 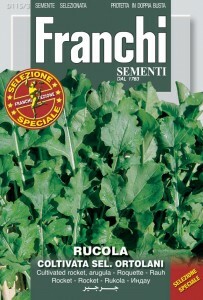 But salad mixes are cut small and may provide more than one cutting from the same plants. 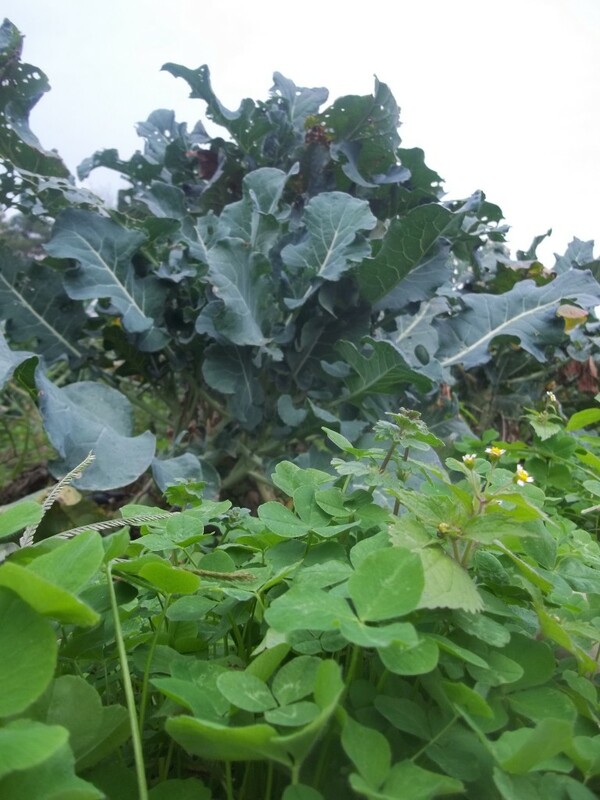 Eat-All Greens are usually harvested just once, then cleared., although it can work to harvest out the biggest plants, leaving others to grow bigger later in the increased space available. 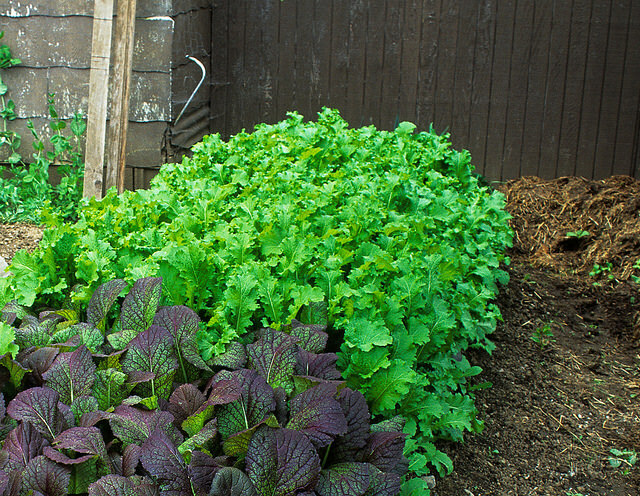 Generally it’s best to grow just one type of Eat-All greens in one patch – mixes don’t do as well, because they grow at different rates to different heights. 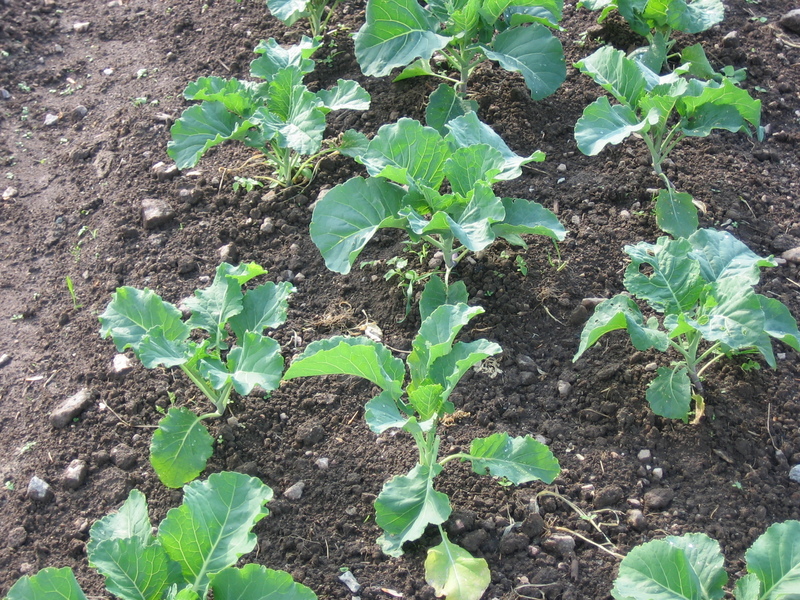 You can sow different patches right next to each other, and harvest whichever is ready. The Eat-All Greens system is a technique to perfect by practice. Spacing, timing, varieties – all can make or break your success. Timing will depend on your climate. Carol can sow in mid-March, harvest in mid-May and follow with a crop of tomatoes or squash. 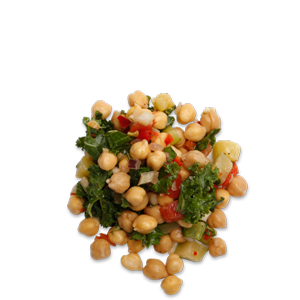 Another garden myth is exploded when Carol points out that we don’t necessarily get maximum nutrition out of greens when we eat them raw. Tables of vitamin C lost when greens are boiled and the water poured away are plain irrelevant if you steam your greens and use the liquid. Assays of nutrients present before and after cooking a food tell us nothing about what we actually absorb. All animals absorb nutrients better from starchy roots and tubers, meat and grains when they are cooked. That has been studied, but there is no information on cooked greens. Clearly raw greens are neither essential nor harmful in themselves. Unclear is whether the claim that raw greens are more nutritious than cooked ones has any basis in fact, or is just plain wrong. Interesting. Carol wrote about dried beans in The Resilient Gardner. Here she writes about varieties suited for eating fresh. 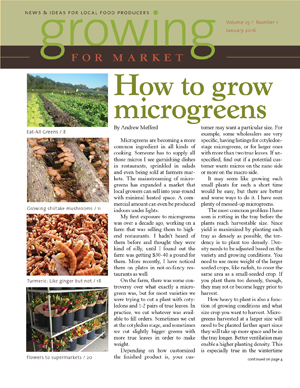 This chapter includes instructions for direct sowing of any large-seeded crop, and explains when trellises or plant supports are needed and what types there are. Edible-podded peas provide much more food from the same space and the same amount of garden labor (and less kitchen labor) than shelling peas do. You need no longer confuse snow peas (flat pods, not sweet, harvested before peas develop much at all), sugar peas (flat pods but sweeter), and snap peas (round cross-section pods harvested after the peas develop full size). Oregon Giant Sugar is a flat sugar type, although it has fleshy succulent pods that can be harvested with fully developed peas. Carol calls this a “flat-snap” type. In England we grew “mangetout” peas, which according to Wikipedia can be either snow or snap peas, but according to the BBC must have flat pods and can be either snow or sugar peas. Thompson & Morgan classifies Oregon Sugar Pod as a mange-tout. Mange-tout is French for “Eat-All”, so they fit right in with Eat-All Greens. For those hoping to follow the Native American practice of growing pole beans on corn, Carol gives detailed instructions – there are so many ways to go wrong! I don’t grow field corn, so I didn’t take notes, but as always, I was very impressed with the helpful precision of Carol’s instructions. She can save so many of us from making wasteful mistakes. Carol recommends we all try some seed-saving, in case of hard times, or for the benefits of selecting traits best suited to our climate and soil. She warns against buying a “Survival Kit” of seeds, as these won’t keep forever, and are unlikely to be varieties suited to your farm or garden. We need to pay attention and develop food crops that reliably feed us, not expect a miracle-in-a-can. Carol helps by leading us through a calculation of how much seed of a staple crop we will need, and how much land we will need to grow that amount of seed. She recommends a rotating stockpile of seed: grow and replace some of your seed every year. At $24.95 this book will pay for itself many times over, and provide enjoyable reading, encouragement and inspiration on the way.